Pearls of Healing – Do Pearls Have Any Health Benefits? It’s impossible to hear the word ‘graphite’ and not think of pencils. To most of us, that is the only use we know of this mineral. What if we tell you that graphite is much more than just pencil lead? What if we tell you that in the near future when electric cars will be dominating the roads, it’s possible that graphite would be the hottest commodity in the market? What if we tell you that diamond and graphite have the exact same composition but totally different properties? In fact, the properties between the two are quite contrary. The mineral graphite might not be shiny, dazzling, and precious-looking like its close relative, but it does brighten our lives nonetheless. This naturally occurring mineral is a form of crystalline carbon. This non-metallic carbon polymorph is found lying deep within metamorphic and igneous rocks. It is opaque and blackish-silver in color and has a dull metallic sheen. This famous mineral has many nicknames. In addition to being called mineral of extremes in colloquial form, it is also often referred to as black lead or plumbago–because of its resemblance with metal lead. Graphite showcases strange contradictory properties. At one hand, it is extremely soft and cleaves with the lightest of pressure; it also has low specific gravity. On the other hand, it is extremely resistant to heat, to such an extent that it remains inert under heat pressure–hence its famous nickname, the mineral of extremes. It is because of these extreme properties that graphite has become one of the widely used minerals in manufacturing and metallurgy. Graphite is a metamorphic mineral that occurs when carbon encounters heat and pressure in the upper mantle and in the Earth’s crust. It goes through a transformation deep under the ground as a result of the heat range, which is 750 degrees Celsius, and pressure range of 75,000 pounds per square inch. Graphite is commonly found in the form of flakes or crystalline layers in metamorphic rocks. Marble, schist’s and gneisses are some of the common rocks that host graphite. This mineral might also be found in organic-rich shales and coal beds. In these cases, graphite may have formed because of organic matter such as dead bacteria or plants. It then goes through a metamorphic transformation to turn into graphite. Graphite also occurs in meteorites and veins; in rare cases, it also occurs in basalt. Since there are so many different locations of this mineral’s formation, it leads to variations in its type of property, even within the same deposit. In order to determine the quality of the graphite, mineralogists try to understand the geological history of the deposit before mining. Both diamond and graphite are composed of the element carbon. The reason why these two minerals are so vastly different is because they are subjected to different conditions. Diamonds undergo extreme pressure and heat in the mantle. Graphite, on the other hand, is found near the earth’s surface, and it transforms at lower temperature and pressure range within the crust. However, the two minerals have nothing in common when it comes to properties. In fact, they have contrasting properties. Graphite is the softest mineral, whereas diamond is the hardest. Diamond is typically transparent, however, graphite is opaque. Graphite makes an excellent lubricant, whereas diamond is often used as an abrasive. It is believed that diamonds found near the Earth’s surface are gradually changing to graphite. It’s a long process, but eventually, there will come a time when most diamonds will turn into graphite. As mentioned, graphite is an excellent conductor and as such, it can be used in a variety of ways to power electrical devices. You can try some experiments with graphite as a conductor here. Graphite makes a perfect dry lubricant because of how slippery it is. If you have ever tried picking up a broken pencil lead, you’d know what we are talking about. When graphite reacts with water vapor in the atmosphere, it deposits a thin layer over adjoining surfaces and very effectively reduces the friction between them. It is because of this lubricating property that graphite is very commonly used in the manufacturing of lubricants of machine parts and metal locks. The mineral is also present in grease. As we mentioned before, graphite is extremely resistant to heat. It can withstand high temperature without showing any changes in its chemical formation. This property makes graphite an excellent choice for refractory material in steel and glass manufacturing industry. It is also used commonly in the iron processing industry. Graphite is used in the manufacturing of graphene sheets. These sheets are noted to be 100 times stronger than steel. They are also 10 times lighter. 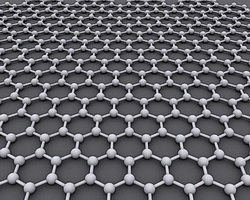 Some uses of graphene can be found here. Graphite is used to make graphene sheets, and these sheets are recognized as one of the strongest materials. Graphene sheets are one of the best choices in the production of various high-quality, super-strength, and lightweight sports equipment. While the uses of graphene sheets in the production of medical equipment are limited at the time, the future possibilities seem endless. One of the first uses of graphite was as a writing material. In fact, the word graphite is derived from the Greek word graphein, which means “to write”. In the 16th century, when the mineral was first discovered in Cumbria, in North England, people thought it was coal. However, it did not burn, so the locals discovered its other use, as an excellent marker of sheepskins. Today, it even helps astronauts take notes in space. The lead in pencils, however, is not purely graphite. It is a mixture of clay and graphite. The carbon family is quite intriguing. Where one mineral is all sparkly and dazzling, the other is not. However, the uses of graphite are much more versatile and valuable. From shiny golf clubs to aircraft, graphite has found its place in many industries. There are experts in this area of geology that say that graphite or more precisely graphein is going to be an up and coming item of need in this growing environment of technology. We just have to wait and see. Can We Still Call Coal ‘the Black Diamond’?